We provide the full range of residential planning and design services for house owners, house builders and developers. Standford House is a detached dwelling dating from the late 19th century and has a contemporary coach house on the north side. The clients wanted to convert and extend the coach house to provide a dwelling for their elderly parents to occupy. Normally a self-contained unit of accommodation can prove difficult to get through the planning system but when the building already exists then Section 55 of the TCPA 1990 sub-section (2) will enable conversion to incidental use without needing planning permission. However the proposal by including an extension went further than would have been regarded as permitted development. Ensuring that the accommodation was tied to the main house. The detailed design was by Cedric Mitchel, Architect, aim was to provide a design that retained the integrity of the building but at the same time achieve the standard of accommodation needed. The client owned a field on a sloping site adjacent to the settlement policy boundary at Ropley Dean. East Hampshire District Council was keen to boost the supply of housing and reduce its 5 year housing land supply deficit. The landscape and tree considerations led to an informal layout where the public footpath crossed the site through a series of open spaces and planted areas. 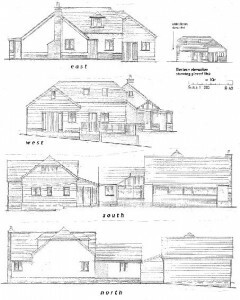 In response to the rising ground levels bungalows were adopted for plots 1 -3; those dwellings closest to existing houses and the final scheme was for fifteen dwellings, six affordable homes and 9 market price homes. Outline planning permission was granted and the detailed scheme is being worked on. The following development team was put together to work on a draw up the scheme for outline planning permission. Pax is a single storey ‘colonial’ bungalow of 108m2. Under EHDC planning policy a replacement dwelling of 162m2 would usually be acceptable. However, through a Certificate of Proposed Lawful Development, it was established that under permitted development the existing dwelling could be extended to 229m2 and this became the benchmark for the replacement dwelling. The locality had a wide range of dwellings styles and designs. 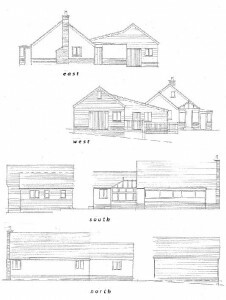 Working with Jon Dale, Architect, detailed plans were drawn up of a two storey four bedroom house in an ‘arts and crafts’ style. Ecology Consultants, ENIMS, provided expert advice on the biodiversity conditions at the site. Detached 2-bed bungalow located in the countryside. It is set back from the public highway. The original property has been previously extended. There is a garage with an integral workshop to the west of the property. A lawful development certificate for a ground floor extension within permitted development rights was approved and constructed. This took the property over the small dwellings threshold. The first floor extension proposed above the ground floor extension to provide an additional bedroom. There would be a dormer window positioned on the east and west elevations. The glazed link proposed to connect the dwelling to the workshop/garage building. The roof height of which would be increased to provide first floor accommodation. Overall the habitable floorspace of the property would increase by 69.6m2. It was accepted by the Local Planning Authority (LPA) that the property did not need to be protected as a small dwelling. Any extensions could therefore exceed 25% of the existing floor area. The LPA considered the scale and mass of the development to be ‘broken up’, and the heights and eaves levels of the roofs kept ‘relatively low’. The proposal was considered to respect the existing character of the bungalow while resulting in quite a significant increase in the scale of the dwelling. It was not considered to result in an unacceptable amount of visual intrusion in the countryside or impact on residential amenity. The relationship with the tyre depot immediately to the east of the site. The LPA considered the proposals to result in “attractive frontage to Bedhampton Road” and overall an “attractive residential development”. 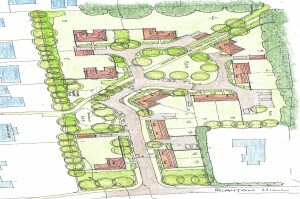 The schemes were considered to make efficient use of land and would provide much needed housing in Havant. The development was considered to enhance the setting of the listed building and have a limited and acceptable impact on neighbouring residents and properties. The LPA was satisfied that there would be no harm to the character and appearance of the area and the proposal would provide a high quality development and a high standard of living for future occupants. The Practice was instructed to submit a prior notification application for the Change of use of former piggery buildings from Agricultural to Residential Use under Class Q, Part3 and Schedule 2 of the GPDO 2015. The application sought confirmation that the extent of demolition and building works required to convert the buildings to dwelling houses was reasonably necessary and that prior approval of matters relating to transport, land contamination and flooding was not required. 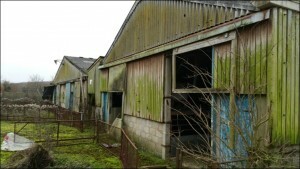 The site contained several large former piggery buildings and piggery buildings which had been redundant for a number of years despite several attempts to market the buildings for agricultural use. The LPA considered the proposals did comply with the conditions, limitations or restrictions as specified in the order. The building was considered able for conversion without the need to include new structural elements. The size of the proposed area of residential curtilage was no larger than the area of the proposed residential dwelling. 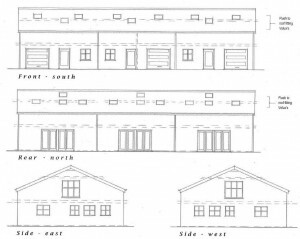 Thus this application was considered to meet the constraints as laid out in the permitted development order. There is sufficient space to the front of each property to provide an additional parking space if required. The proposal included the potential for further demolition and restricted use of the site in order to satisfy the Public Protection Officer. The application was approved subject to conditions.